Despite holding rates steady on Wednesday, the Federal Reserve signaled future rate hikes with its upgraded assessment of the US economy - describing it as "strong" with "solid" growth. Inflation is close to their 2% target based on the Fed's preferred metric, the Personal Consumption Expenditures (PCE) - while its cousin, the Consumer Price Index (CPI) rose 2.9% year-over-year. And while the official figures suggest inflation is well in check, Americans seem to be having a totally different experience at home - as rising gas prices and an escalating trade war are already putting a serious dent in disposable income (with $200 billion in Chinese goods at risk of a new, 25% tariff). And while industries tied to discretionary spending such as luxury goods and RV's have already taken a hit, Americans should probably strap in - as goods exposed to tariffs as well as higher fuel and raw-material costs are set to cause more pain in consumer wallets, reports the Associated Press. 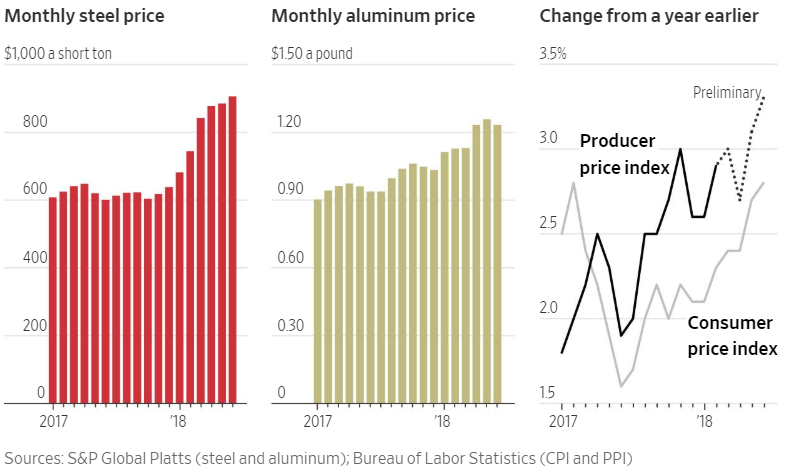 Thanks to steel and aluminum tariffs imposed in May aimed at boosting America's manufacturing base, steel and aluminum prices have risen by 33% and 11% respectively - trend which could cost the US beverage industry nearly $348 million, according to The Beer Institute. Meanwhile, higher prices across several industries have already taken their toll on household budgets. And as we reported on Tuesday, Americans are already facing higher prices for key staples and other consumables. Last week, Coca-Cola CEO James Quincey said tariffs are going to inflate drink prices. “Clearly it’s disruptive for us. It’s disruptive for our customers,” Quincey said. Proctor & Gamble similarly warned of squeezed profit margins due to higher costs and rising competition. As a result, the prices of Bounty paper towels, Pampers diapers, Charmin toilet paper and Puffs tissues are going up and average of 4%. Price hikes on other key items are also causing pain throughout the economy, such as gasoline, which has surged over 24% in the last year, while June rents and other housing costs were up 3.4% year-over-year, and auto insurance spiked over 7% during the same period. To cope, people are cutting back wherever they can. Thanks to rising fuel costs, airlines have been cutting unprofitable flights from schedules, as spot prices for jet fuel are 50% higher than they were a year ago. American Airlines suffered a huge hit to its second-quarter profits, which fell by over 1/3 as spending on fuel surged. In response CEO William Douglas Parker warned about rising fares - while Delta CEO Edward Bastian anticipated prices rising around 4% over last year. Homebuilders are anticipating pain as well, as Tariffs Trump imposed on Canadian softwood lumber (which Canada was heavily subsidizing to undercut US producers), have boosted the average cost of home construction by $7,000 - an increase which will undoubtedly be passed along to home buyers, which may translate to a possible slowdown in home construction. AP notes that both building permits and ground breakings slowed in June, according to the Commerce Department. Meanwhile, real hourly wages have fallen 0.2% in June from a year earlier among production and nonsupervisory employees - a category which includes blue-collar workers. Last month, JP Morgan chief global strategist David Kelly noted "Wage growth remains surprisingly weak," which he suspects is a net plus for producers. "The remarkable ability of firms to lure more workers back into the labor force and get stronger productivity gains from them without raising wages is a clear positive for profits." Workers, on the other hand, may find themselves "enjoying" their winter bundled up with a nice hot cup of Ramen noodles.